Iceland is a travel destination on everyone's lists at the moment; the land of ice and fire filled with breathtaking landscapes, wild roads and jaw-droppingly stunning drives. It is the perfect place for a road-trip, whether you're heading there for a couple of weeks or just a few days; you'll leave with a sense of wonder after being dazzled by Europe's largest waterfalls, thermal pools, valley glaciers and, if you're lucky, the breathtaking sight of the aurora borealis on a polar night. With a population of only around 330,000 and an area of 103,000 km2, Iceland is the most sparsely populated country in Europe. What better place to escape the hustle of life than to this northerly Nordic country known for it's quirky people and otherworldy landscapes; a place where nature astounds you and where the pace of life is calm and slow. This guide covers the South Coast of the country - probably the most touristed area, but in our opinion the best road-trip for a first look at the country. We drive 500km east of Reykjavik to Jokulsarlon Glacier Lagoon and back again, visiting isolated beaches, gushing waterfalls, nature reserves and picturesque villages. The ideal time for this trip is three days (hiring a car from the airport), but if you have less time simply cut a few locations out or don't head quite as far as the lagoon. Everything in Iceland is guaranteed to blow you away, so don't worry about not being able to pack everything in. It is more than likely that you have already seen a photo of Gullfoss, being Iceland's most famous waterfall and an icon of the country. Yet, despite that, nothing compares to witnessing this astounding natural site with your own eyes; water tumbling 32m into a deep canyon surrounded by green mosses and obscured by the dramatic water spray that sends a cloud of mist into the air (make sure you're wearing waterproofs and have something protective for any cameras or phones!). On a clear day, the mist can create rainbows across the falls making the whole scene somewhat overwhelming. On a grey, drizzly day (like when we visited), the sheer power of the falls and sound of the water falling into the canyon might just outdo the sight. 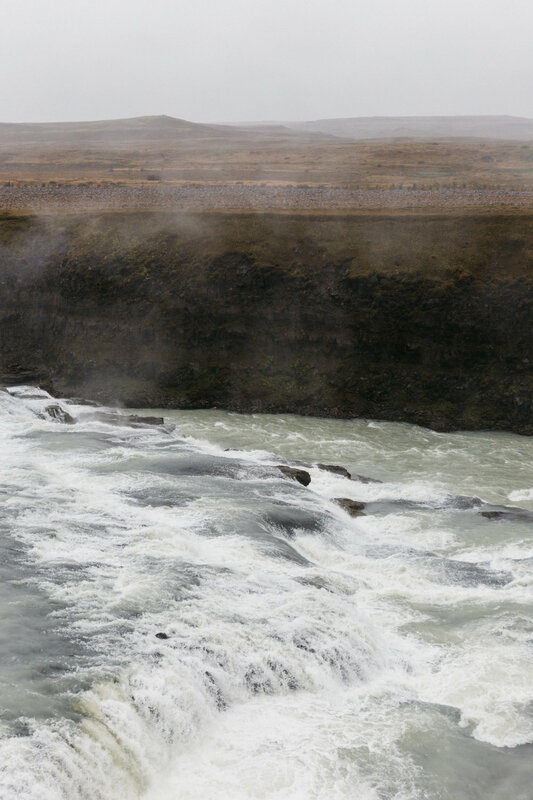 Getting there: Gullfoss is part of the Golden Circle, meaning there are many tours you can take to the falls from Reykjavik. If driving, head east from Reykjavik on highway 1, then take highway 35 to the falls. Food & drink: There is a cafe and gift shop at the falls, though be aware that food in touristy places in Iceland is very expensive! We'd recommend stopping at a supermarket near Reykjavik to stock up on food for your trip. Seljalandsfoss is another of Iceland's famous waterfalls along route 1, located within a pretty meadow with water gushing over a cliff-face; this makes it possible to walk behind the waterfall, a popular choice with tourists. Yet though the waterfall is undeniably stunning, the volume of visitors does detract from its natural beauty; so we'd recommend walking down to Gljúfrabúi, a hidden waterfall within a cave just a 5 minute walk from Seljalandsfoss. Due to the fact that most people don't know Gljúfrabúi is there, and because of the slight difficulty in treading over the single-lane stepping stones to get inside the cave, this waterfall feels much more secluded and natural and is certainly worth venturing to when stopping on Route 1. Getting there: Seljalandsfoss and Gljúfrabú are situated on Route 1, around an hour and a half from Reykjavik. You do have to pay to park here, and it's not exactly cheap! When we visited (October 2017), it cost 700ISK (around £5). There are free toilets in the carpark. Food & drink: There is a small food cart in the carpark. Iceland is known for its thermal baths, hidden gems scattered at the side of the road; hot tubs in the most spectacular of settings. One of those is Seljavallalaug situated on Route 1. It has become quite well-known thanks to Instagram, so while a few years ago you'd have the whole place to yourself, today you might be sharing the pool with 10 other people. The water was also pretty cold when we visited, but it was still breathtaking to see this natural swimming pool nestled within the hills. Even if you decide not to brave the cold water, the hike out to the pool is spectacular and feels a world away from busy Route 1. Visit early in the morning to try to beat the crowds! Getting there: Seljavallalaug Swimming Pool is situated just off Route 1. If travelling east from Reykjavik, turn left onto the 242 and continue along the road until it becomes gravel. Continue until you reach a small parking area near some buildings. From here, continue on foot for around 15 minutes keeping to the left of the valley alongside a small stream until the swimming pool comes into site. Another very popular stop along Route 1 is Skógafoss, a 60m falls nestled into the green, rocky cliffs that it is possible to walk up to get an overhead view of the falls. The amount of spray created from the waterfall means that a single or double rainbow is almost always visible over the gushing water, making Skógafoss an excellent stop along your roadtrip. Getting there: Skógafoss is situated on Route 1, around a 2-hour drive from Reykjavik. Continuing along Route 1, the landscape starts to become somewhat otherworldy with long stretches of black sand beaches along the coast. 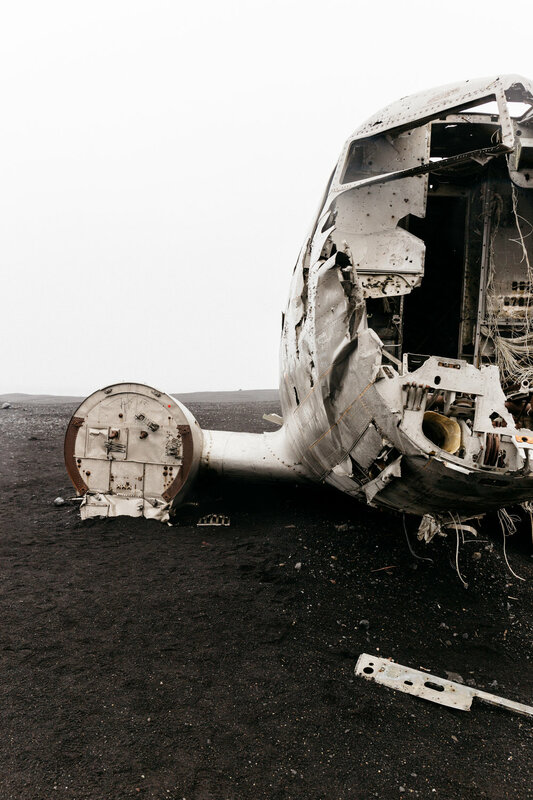 This particular stop will take you along one of those beaches towards the Solheimasandur Plane Wreck, before heading down to see the crashing waves along the shore. Walking along the black sand with Iceland's spectacular hills surrounding you is certainly something you won't forget. Getting there: Heading east on Highway 1 from Reykjavik, there is a parking area on the right hand side, just after the low bridge and turning for route 221. Walk along the pathway to reach the plane wreck, then head beyond to the coast. A stunning peninsula on the south coast of Iceland, where white waves send sea spray and frothy bubbles to the shore, and expansive views of black sand, jagged cliffs and yellow grass frame the scene. Dyrhólaey is an idyllic spot to admire breathtaking views, enjoy a few hours wandering along the black sand beach, or have a picnic atop a sea-cliff. Getting there: Heading east o Highway 1 from Reykjavik, take a right hand turn onto the 218 just 12km before Vik. It's possible to park at the lighthouse, or take the turn for Kirkjufjara beach to wander along the shores. A deep and winding river canyon that has to be one of the most stunning and iconic sites in Iceland. The canyon is thought to be about 2 million years old, formed in the Ice Age, and is unlike anywhere you may have seen before. Mossy walls stand 100 metres high and the river runs for 2km through the centre of the canyon; ramble along the footpath looking down on it and marvel at the incredulity that Iceland has on offer. Getting there: Continue on Highway 1 after Vik, taking a left hand turn to the canyon. The final part of the trail is gravel and steep, opening on a carpark at the foot of the canyon. Still, blue waters dotted with floating icebergs, a black sand beach and moody skies. There is nothing quite so epic and unique as the Jökulsárlón Ice Lagoon, the last stop on this road trip on the South Coast of Iceland. Visit early in the morning to have the lagoon all to yourself, or in winter when the glacial waters are filled with seals. This has to be one of the most photogenic and breathtaking spots in Iceland. Certainly a spot not to be missed. Getting there: Continue on Highway 1. The Jökulsárlón Ice Lagoon is located rough;y half an hour from the small village of Hof. The drive from Reykjavik takes 5-6 hours direct. Please be mindful that these spectacular locations in Iceland belong to Mother Nature and to the people of Iceland who work to protect and conserve their native land. Please leave the country as you found it; taking away your rubbish, only walking on paths and driving on designated roads, and respecting the country’s rules and regulations. Love the land but leave no trace.